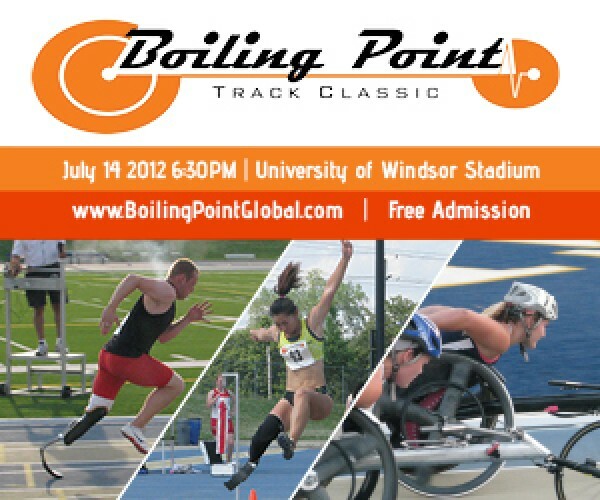 On July 14th the International Boiling Point Track Classic will take place here in Windsor, at the University of Windsor Stadium, where Canadian Paralympic athletes will have their last chance at qualifying for the upcoming 2012 Paralympic Games. Named for Windsor’s hot summer temperatures, Boiling Point is the creation of Wallaceburg’s Jeff May, a former athlete with a disability himself. Founded in 2007, Boiling Point contains all Paralympic track meet events, including racing, field events, and throwing competitions. The events are organized to ensure an equal playing field, but each event has its own equal cash prize for the first, second, and third place finishers. Four World Records in both the women’s wheelchair and amputee 100-meter and 200-meter events have been broken during Boiling Point competitions, and 56 medals were won at the 2008 Beijing Paralympic Summer Games by athletes who have previously competed at Boiling Point. Featured athletes for this year’s event include reining World Champion, Jerome Singleton (USA), the fastest amputee on the planet, and World Record holder, Leo-Pekka Tahti (Finland), the fastest man on wheels! Come cheer on athletes from around the world, including Finland and Germany. This year’s event will also feature the entire United States Paralympic team, which is sure to rouse up a friendly rivalry. The event is free to attend and runs all day on July 14th, with the All Comers Section from 10am to 5pm and the Elite Finals Section from 6:30 to 9pm.